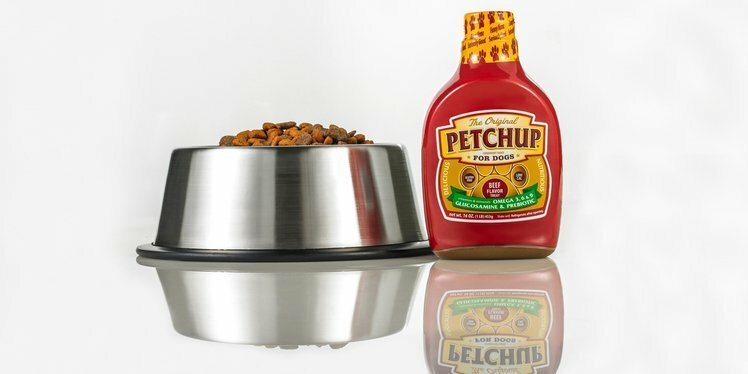 We re cently had the opportunity to try Petchup®, a tasty and nutritious condiment for dry dog food, with three of our dogs. The result was waggin’ tails all about! Three out of three dogs absolutely loved their food with Petchup®. Generally when they are given only kibble they tend to not eat it all. With Petchup® they didn’t leave a single piece of kibble, not a single crumb, and they licked their bowls clean. Then they went to each other’s bowls and licked them clean again. Now when they see the Petchup® bottle coming out they know they are in for a special treat with their dinner. 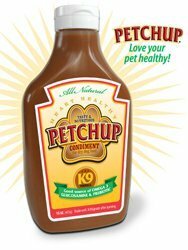 Petchup® is a nutritious supplement made with all natural, human-grade ingredients as well as a healthy portion of vitamins and minerals. Full nutrition information and ingredients are provided on the Petchup® website. The Petchup® company is based in the state of Colorado in the United States. They are in the process of setting up online ordering via their web site, so check back with them often for ordering information. They also have a listing of Colorado stores where Petchup® is currently sold. Make your dogs happy – buy them some Petchup® and watch those tails wag! After your dog’s Petchup® experience, be sure to come back and rate the Petchup® product.